When I was 18, I was in a performance of “The Normal Heart” at Oberlin College. 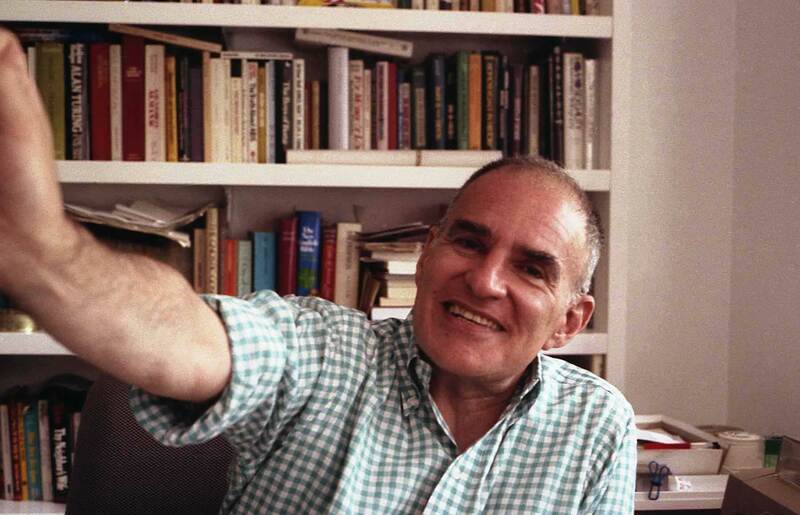 Larry Kramer, the author and one of my idols at the time, came to see it. 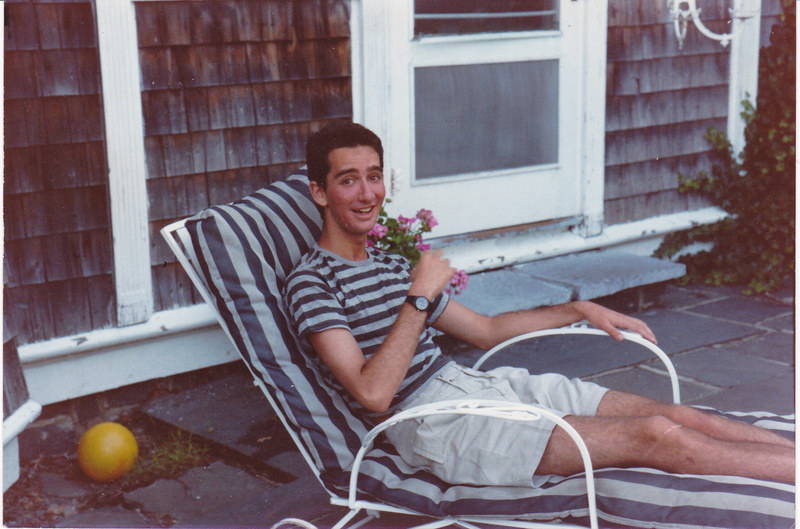 Billy (not Bill, not yet) in 1989. He repeated this advice to me a year later, when I returned to New York from Oberlin and asked him about how to get involved with ACT UP. To be clear: that was not his advice about how to become more of an activist. He said it more along the lines of, “I remember you…” and then he repeated it. So today I would like to be Larry Kramer to your young Billy Konigsberg. No, I do not think I could ever fill Larry’s shoes as a writer or a human. The point is, I’m a writer and you are (ostensibly) a young gay person. To me, this is not trivial advice. Finding a boyfriend, compared to joining ACT UP, seems trivial, but I think Larry’s comment was meant to help me realize the value of finding someone to share my life with. Yes, AIDS was then and still is the worst tragedy of our lifetimes. Millions have perished, and millions more may. Larry’s generation of gay men suffered horribly; a large percentage of gay man who would today be 50-70 died, and way, way too young, and horribly. But even that does not trivialize the importance of the advice he was offering me. Now, in the name of being real, I must tell you that I didn’t find my One for 14 years after getting that advice. And also in the name of being real, I made every mistake in the book, and some not in the book, along the way. And keeping it real, I continued to make tons of mistakes during my relationship, and those mistakes continue to this very day. I am a deeply imperfect man. I assume most of us are deeply imperfect, but I know that I am especially so. I am selfish and self-centered and moody. I am impulsive and I have never met a feeling I didn’t think I should express freely. All of these things conspire against a good relationship. All that said, I would like to offer you 10 tips on how to find your Ben. Ben, as some of you may know and many of you may not, is a character from Openly Straight. He is loosely based on my Chuck, with whom I have been in a relationship since December of 2003. When I was on the Openly YA Tour a couple weeks ago, I was amazed at how many people came up to me and told me that they’d read Openly Straight and now had the biggest crush on Ben. 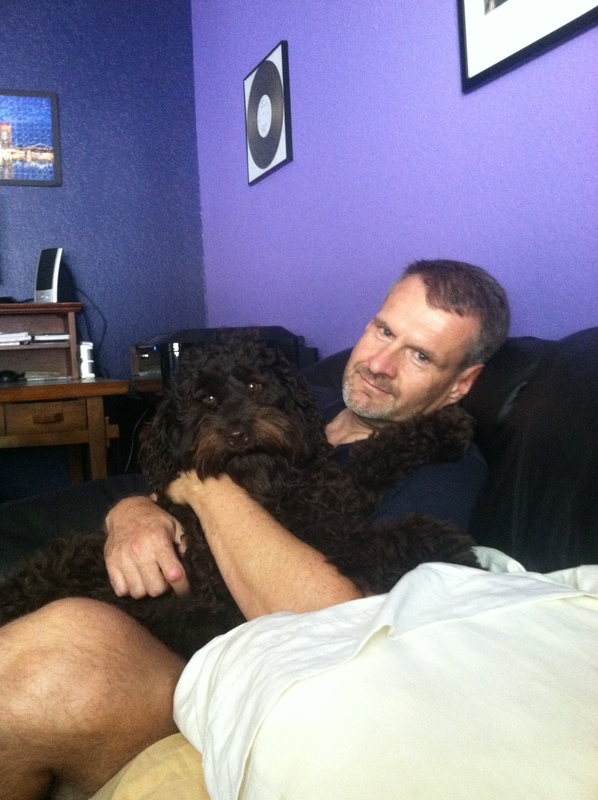 Chuck in 2012, with our dog Mabel. Chuck minus 30-some years plus a little more soccer-playing ability equals Ben. Ben is an unusual guy, not quite the typical teen heartthrob; he’s muscular, but thick muscular rather than swimmer’s build-muscular; he has a great vocabulary and he likes to read; and he’s sensitive and thoughtful. He’s a hot nerd/farm boy/athletic-but-not-a-jock. 1. Be friends first. I know, I know. The excitement of a new person is overwhelming. I’ve been there. Many, many, many times. Add a few manys and you’ll get the idea. But if you’re serious about wanting this person in your life for a while, consider putting those feelings aside for a while. Years from now, it will be far more important if you like to talk to this person than if you like to … you get the point. 2. Don’t put those feelings away for TOO long. Bert and Ernie became Bert and Ernie because they decided to be ONLY friends, and then they got curmudgeony together, and soon they just sat in bed, railing against the injustices of the world, or the alphabet, or whatever it is Bert and Ernie talk about. It’s been a while since I’ve watched Sesame Street. 3. Get offline. I’m sorry, but it needs to be said. Yes, I met Chuck on Match.com, and yes, many people meet that way. But it’s so easy to get sidetracked when we start with photos and stilted, written conversation. How do we know what sort of friendship/sexual chemistry we have with someone we meet electronically? Instead, focus on being active in groups where you think like-minded people may also be active. Also, being online can become addictive. If there’s a constant stream of possible companions on your computer, it makes it really easy to decide you’d rather keep looking for the perfect one, even after you’ve found him. 4. If you’re outgoing, seek out the quiet ones. Those of us who like to have fun, sometimes we see shiny things and we get intrigued. Shiny can be exciting for a while, but in the end, the luster goes away. If you really want a long-term boyfriend/husband, seek out someone who isn’t so “out there.” You may be surprised at the unseen depth, and the fact that some people wear their shine on the inside. Allow your outside shine to be matched by their inside one. 5. If you’re not outgoing, seek someone who is. Your comfort zone is solitude, which is great. If you marry another quiet person, you may find yourself in a few years wishing you had someone to help you expend your horizons. 6. Be you. Not, like, from the first minute you meet him. That’s just crazy. You need to put your best self forward if you want your Ben to want to see you again. But the truth is we’re all messed up. You are, I am, Ben is. We all have stuff. The longer you shield each other from that painful truth, the worse a jolt back to reality it will be. 6a, or 7. Let’s be really clear about this, shall we? This means you are not a super-human who never goes to the bathroom. This means you don’t just happen to wake up with beautiful, fresh breath every morning because your insides are lilacs and pansies (poor flower choice, I know). This means you sometimes get pissed off with no reason, because that’s just a fact. Let this be clear sooner, rather than later. You may be surprised to find out that your Ben is glad to know these things, too. And if he isn’t, you don’t want to get too close to him, because he’s gonna always be looking for someone who isn’t human, and he’ll never find him. 8. Don’t spend too much time talking about your exes. It’s human nature to want to share your stories with your new boyfriend, but there are problems here. If you’re talking about the old, you’re still living there. Also, your new boyfriend is painfully aware that a comparison is being made. Even if it’s favorable NOW, he knows that you are speaking about someone you used to hold in high esteem and now you don’t. Bad choice. Let your exes go. 9. Know that you are the problem. If you’re unhappy with the person, take a close look at things. Have you had this problem with previous boyfriends? Frequently? What role do you play in this problem? What’s the common denominator in this problem you’ve had multiple times? Could it be you? Frequently our own attitudes shape our happiness or lack thereof. If there’s something you really can’t take, and you’re sure of that, fine. But often, if we look closely at places where we feel our partner is making us unhappy, we may be able to see places where we keep doing the same thing, and it’s not working. We can make changes to ourselves far more easily than we can change our boyfriends/partners/spouses. 10. Make decisions about your relationship boundaries, and keep communicating about them. Nothing is worse for a relationship than lies. Withholding information builds a wedge between you, and only the truth can vanquish that wedge. So what I’m saying is, there are tons of ways to build a relationship today. You can have total monogamy, you can have an open relationship, you can have a relationship with more than one person. In the world we live in today, anything is possible. But it takes communication. Do not assume you’re in the same place. Talk it out. Always talk it out. Never assume you’re in the same place. Make sure you are. So … you’re a cute kid/guy/gal/woman/man. Find yourself a boyfriend/girlfriend/husband/wife! I gotta admit, I have the biggest crush on Ben now. I may or may not have bawled after reading the last page of Open Straight … Anyway, this is a really great post! I imagine the ‘get offline’ advice would be difficult to practice for some people.